Descend deep into the ocean with one of the world's most mysterious and deadly predators, as Animal Planets presents ‘Shark Month’. This special season of programming features the fascinating ‘Shark Attack File’, this harrowing hour reveals the science behind what triggers sharks to attack at certain times of day, and what rules humans should follow to avoid incident. Interactions between sharks and humans have bloody consequences when a Great White invades the high tides for some surfers in the early morning hours near Monterey, California, a tiger shark attacks a Peace Corps Worker in the late afternoon in Tonga, South Pacific Islands and a bull shark targets a college student who goes for a late night swim in Sarasota, Florida. 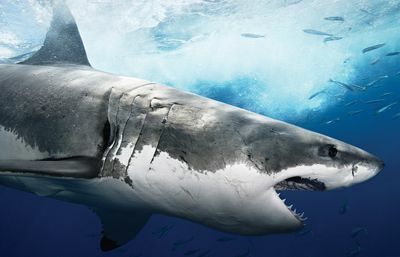 This gripping hour reminds viewers that sharks are predictable animals-for the most part. But can break the rules when you are a visitor in their vast and complex ocean, where anything can happen.